Dr. Sophocles was born and raised in Wallingford, Pennsylvania, where he was educated in the Wallingford-Swarthmore school district. He graduated from Trinity College in Hartford, Connecticut in 1983 with a degree in Biochemistry. Dr. Sophocles returned to the Philadelphia area to continue his education at the University of Pennsylvania School of Dental Medicine. Since graduating in 1987, he has studied regularly on a postgraduate level in the areas of implant dentistry, periodontics, prosthodontics, and cosmetic dentistry, with a special interest in porcelain and composite restorations. An active Penn Dental alumnus, Dr. Sophocles has served both as a member at large on the Executive Board of the Alumni Society (2005-2012), as well as a Clinical Assistant Professor in the Department of Preventative and Restorative Sciences (2006- 2014). Dr. Sophocles has been consistently selected by his peers as one of the top cosmetic dentists in the Western Philadelphia suburbs, as reported in Main Line Today in 2006, 2008, 2009, 2010, 2011, 2012, 2013, 2014, 2015, 2016 and 2017. He was also selected as the top dentist in cosmetic dentistry by Philadelphia Magazine for 2012, 2014 and 2016. Outside the office Dr. Sophocles is also an accomplished jazz pianist and has performed and recorded widely since 1980. A list of his upcoming performances can be found on his personal Web site. 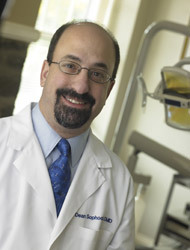 Dr. Sophocles is married with two children and resides in Swarthmore, Pennsylvania.